Now that we have got your attention, may we ask you why are your nails not kept in the pinkest of health and fashion? It is time you pay good attention to those nails too, just as you would to your makeup needs and hairdos as well. If you thought of getting a French manicure done and didn’t have the money or the time to visit a nail art studio and get the same; worry not. We are here to help you achieve what you thought was impossible in nine easy steps at home. Take a look at the mini tutorial below and seek inspiration from the same. Here goes! 1. Your nails should first get a thorough cleaning with the help of cotton and the non-acetone remover. 2. Once that is done, get the cuticles removed and pushed back. 3. Now it would be time for you to soak and scrub the fingers and your nails for three minutes, using the sugar exfoliating scrub. Make one at home or pick up what we have recommended. 4. Once the cleaning is done and the exfoliation complete; the cuticles would need to be softened, pushed back and cut. Do this with the help of the orange wood stick and a cuticle clipper- be careful! 5. Clean up with the non-acetone once again to remove any traces of oil and dirt, and then apply the first layer of base coat. This will help smoothen out the ridges and also create an even surface for the nail polish to sit on. Just one thin coat is needed. 6. Wait for it to dry; use a UV lamp if you have one or wait for five minutes until it dries and cures completely. 7. Take your preferred choice of nail polish; apply a thin layer at first, starting from the middle and all the way to the end and around the cuticle zone. Wait for it to dry. 8. Once it is dry, here is a hack that you would love. Take a very thin strip of tape and place it at the smile of the nails – the portion that faces outwards- this is where we shall paint the zone white. 9. Use a white polish to paint the area inside the outer smile section in matte white. Wait for five minutes and then apply two layers of a top coat, to shine the nails out. Don’t touch a thing for the next five minutes or until the nails dry. If you feel even after five minutes that the nails are sticky; apply a thin layer of non-acetone on them and it would settle the stickiness for good. 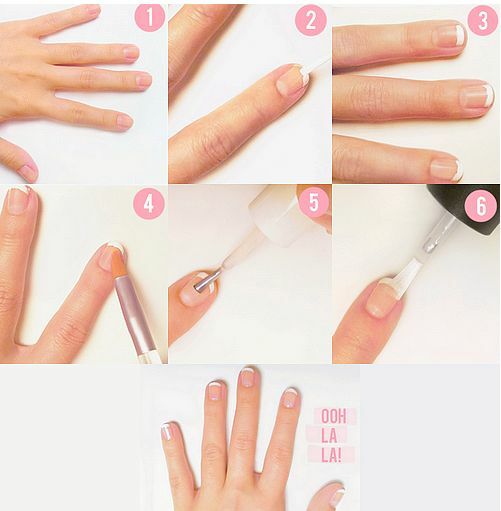 You now have gorgeous French manicured nails!